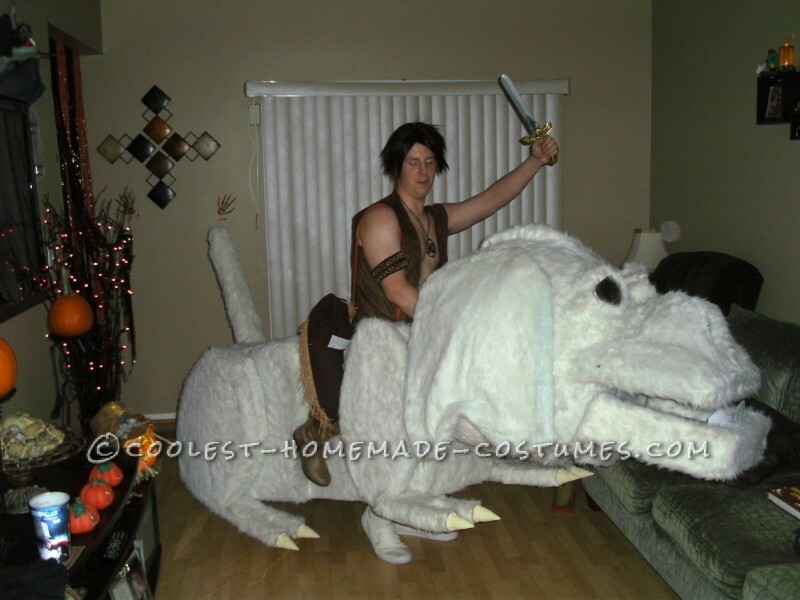 Amazingly Awesome Falkor and Atreyu Homemade Costume! One of my favorite movies from when I was a kid was the Neverending Story. It follows the adventures of Atreyu, Falkor, Bastian, and the Childlike Empress as they try and stop the “Nothing” from destroying their worlds. As a kid, I think everyone who saw the movie wanted to ride Falkor! 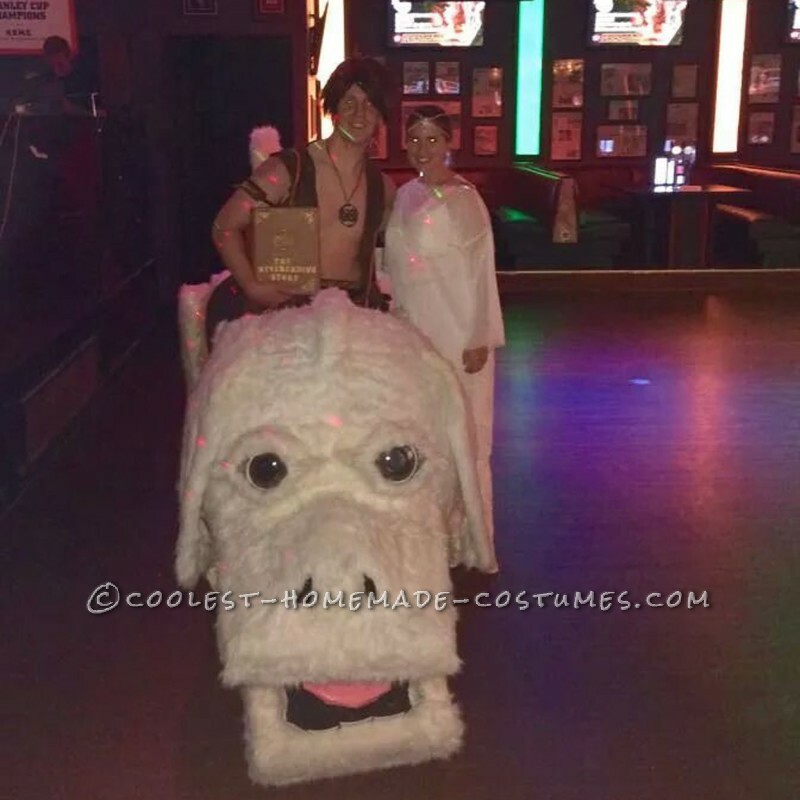 I tried to make everyone’s wish come true and constructed the biggest Falkor homemade costume for everyone to ride! Hard to say, but I think this might be one of my favorite costumes yet! Please feel free to ask me any questions, and if you like this costume, please take a look at the other costumes I submitted this year! 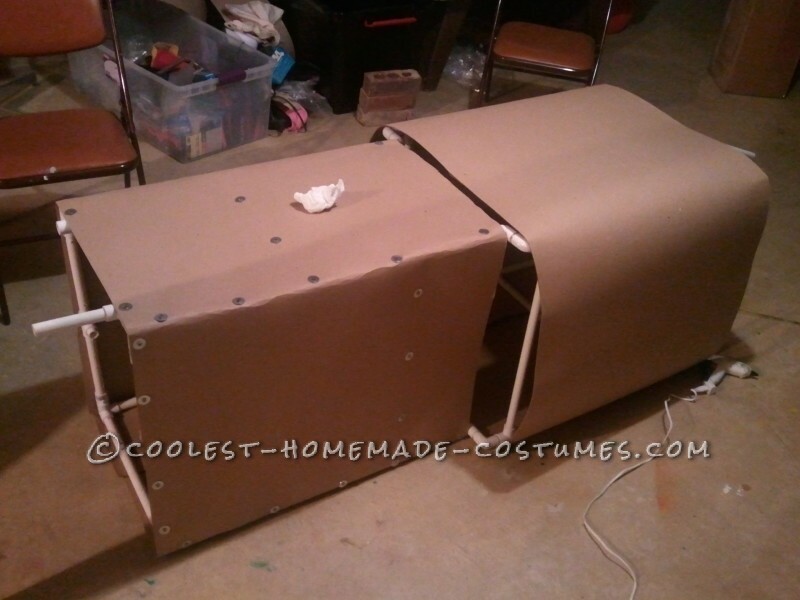 I hope this costume brings back some great memories from when you were a kid! Falkor, Atreyu, and the Childlike Empress!! 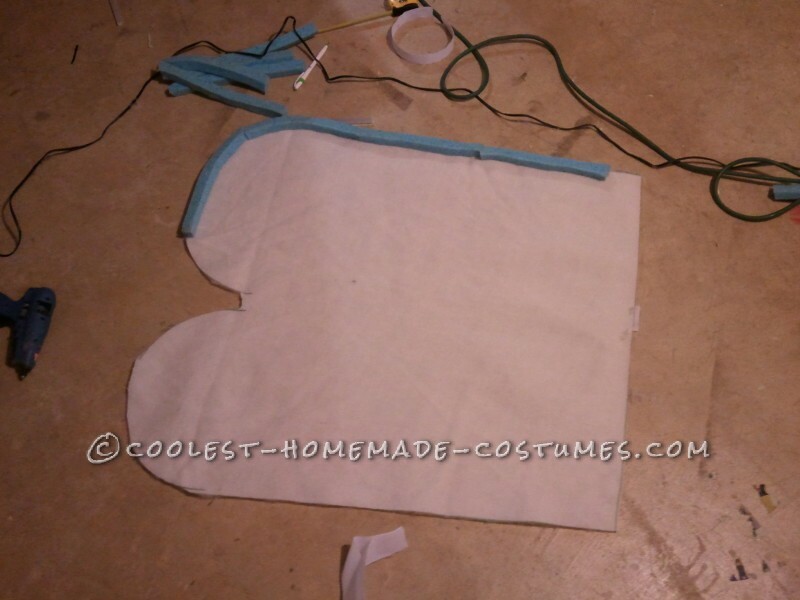 Starting this costume, I needed to make sure the body of Falkor could support his large head. 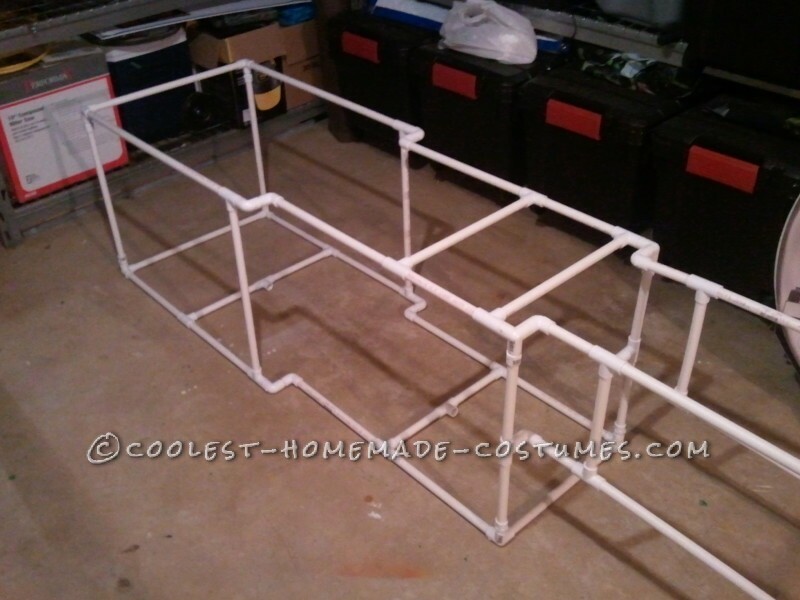 A great way to do this was to construct the body out of 1/2″ PVC pipe. That way, the head could lock into the body. When I first started making the body, I had to scale it down multiple times. I needed to make sure the body was light enough so that I could wear the whole costume as a harness on my shoulders. It would give the impression that Falkor was flying! 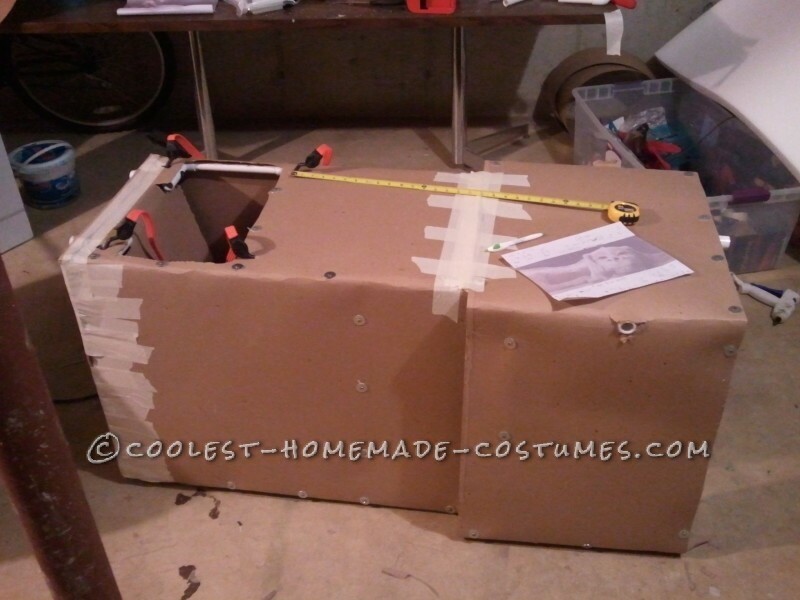 Once the body skeleton was made from PVC pipe, I covered the body in 1/8″ floor underlayment. I zip tied and hot glued the underlayment into place. The next step was to cover the body in fake white hair. This process took over 100 glue sticks to complete! I had to make sure I left openings for the legs, head, and tail. For the harness, I used two bungee cords and zip tied them down to the PVC skeleton. 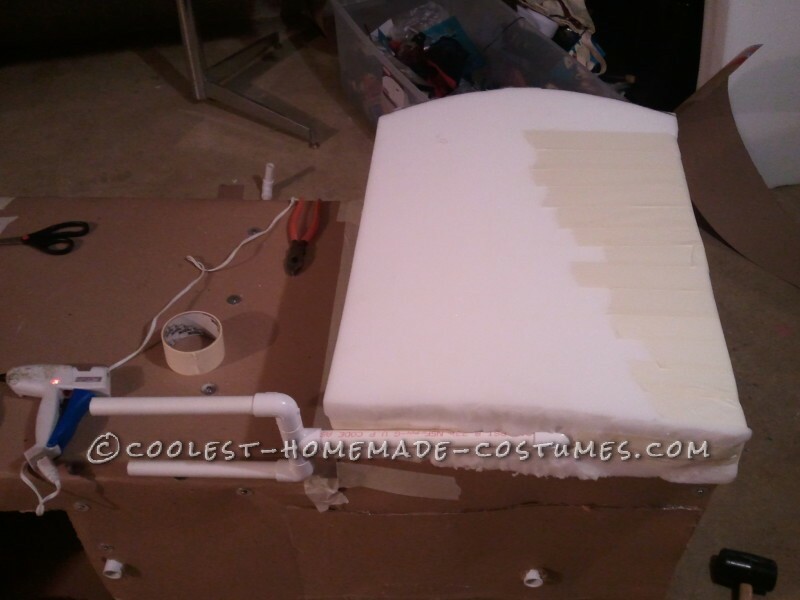 The tail was PVC pipe covered with memory foam from a Queen size sleep topper. Starting this costume, I knew Falkor’s head was going to be the hardest part to make and get right! I started with a large beach ball and added two layers of masking tape. 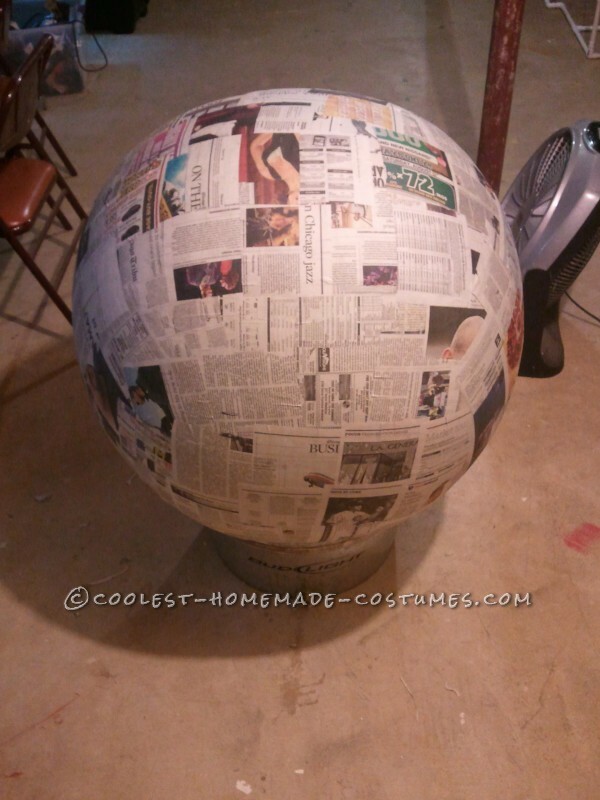 The next step was to paper mache the ball over and over again until it was a rock hard ball. 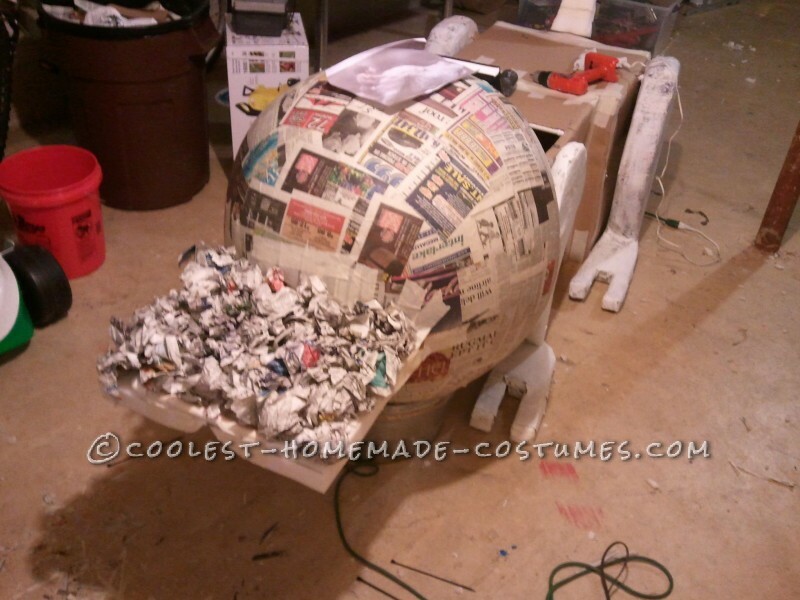 This took about 14 layers of paper mache to accomplish! Once the ball was solid, I cut a hole in the back of the head so I could build the inside of Falkors head out of PVC. This part had to be PVC, so it could connect to the body and so I could make a movable jaw. The inside PVC would also extend out through the front of Falkor’s face to allow a nose to be constructed. Crunching up a bunch of newspaper gave me the general shape I needed for upper mouth and nose. Once the shape was ready, I paper mached the area multiple times. After the upper mouth was finished, I cut another hole in the front for Falkors lower jaw. The jaw was made from foam and cardboard. The teeth were made from cutting up a white painters bucket. The lower jaw was connected the to upper jaw by springs. This allowed for the jaw to move a little when I walked making Falkor look more real. I used two pieces of PVC pipe to form an “L” shape and zip tied the PVC to the lower jaw of Falkor. This allowed me to stick my hand in the head of Falkor and move the jaw up and down to make it look like he was laughing or talking. For the eyes, I found a round clear plastic ball and cut it in half. The inside part of his eyes is a rubber felt material spray painted to make his eyes look brown. Falkor’s ears are made from fake fur. The outer edges are memory foam, and I used a rainbow see through fabric for the inside of his ears. Once the outline of the face was done, I covered the whole head in white fake fur using hot glue. Also, to make the head stand out a little more, I added rainbow lights to the eyes and mouth. 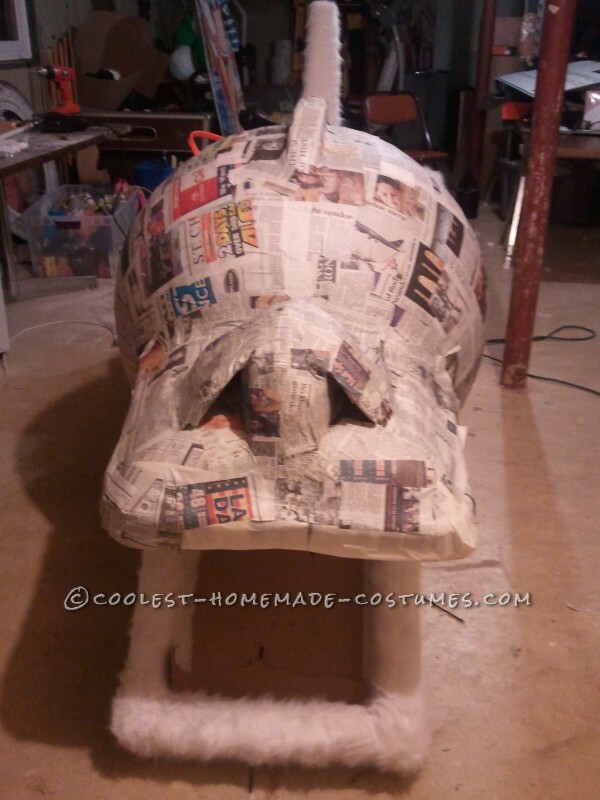 To make Falkor’s legs, I used 1/2″ PVC pipe and foam. Falkors talons are actually cut down ice cream cone dog toys. The legs are connected using PVC pipe and it also allowed me to take the legs off if needed when transporting the costume. 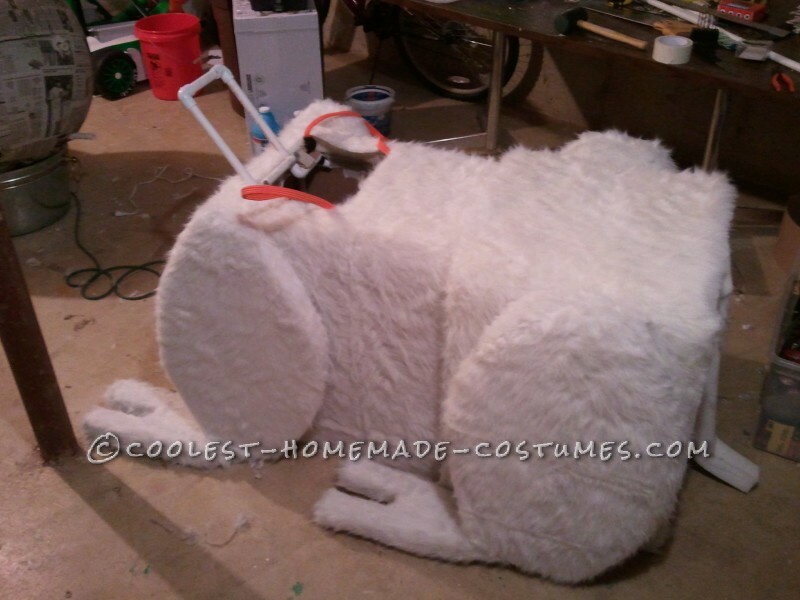 Once the foam was cut down to shape, I covered all four legs in white fake fur. I make the back legs slightly bigger to give it a more authentic look! For Atreyu’s legs, I used pool noodles and zip tied them down to the body. 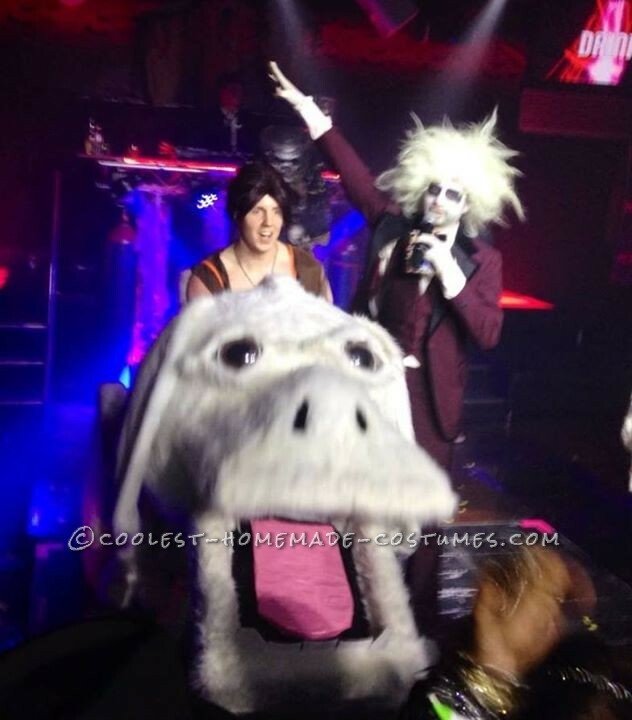 My main legs were in white tights, so it gave the appearance that Atreyu was riding Falkor. For Atreyu’s main costume, I was able to find an Indian costume and altered it to look more like the outfit from the Neverending Story. I found some old used children’s boots to use for shoes. At first, I tired to make the Auryn necklace myself, but it was not looking right. Considering how important the necklace is to the costume, I needed to make sure it was perfect! I was able to buy an exact replica online! The wig for the costume was just your standard black wig. As a last minute added bonus to the costume, my wife decided she would be the Childlike Empress! We were able to find a white dress that matched her costume from the movie very closely. For the shawl, we bought some glittery fabric and sewed the fabric into the shape of a shawl. We made her head dress out of bendable wire and added beads to the wire. We lucked out and were able to find a charm and pearl to complete the head piece at a local bead store. The final prop was the Neverending Story Book! I went to Goodwill and found a book that is similar in size to the book from the movie. 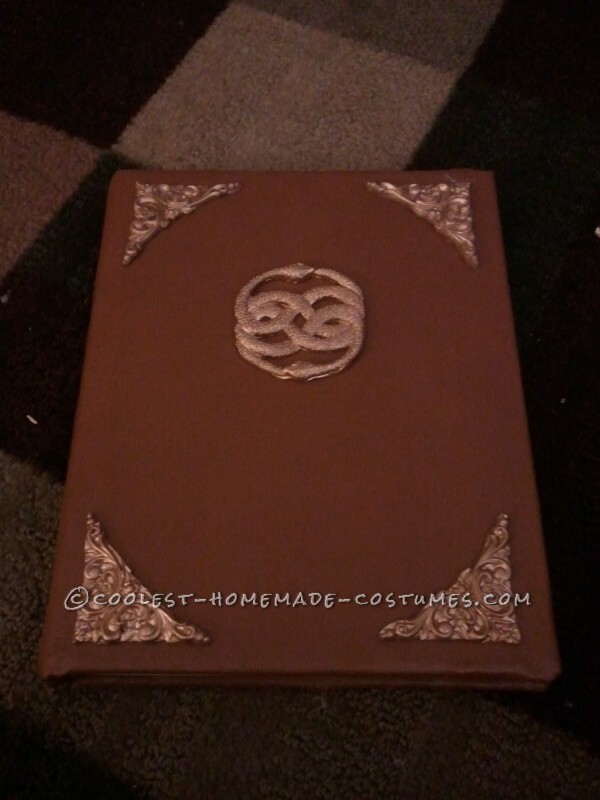 I covered the book in fake brown leather and decorated the front to make it look identical to the movie. All of the pieces from the front of the book were painted gold. I also added a small sword to the fake Atretu legs to help complete the overall look! Overall, I had a great time making this costume and it turned out great. Everywhere I went, people were yelling “Atreyu!”. There were even people laying on the ground so they could take a picture right next to Falkor! My wife also received some great attention as the Chillike Empress. She was the perfect finishing touch. With every costume there are good and bad things. 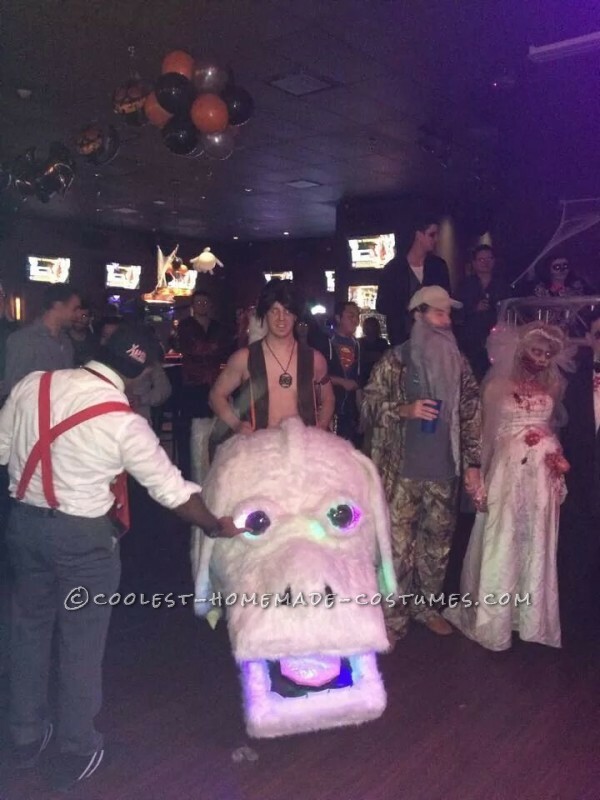 The costume overall was a little heavy, so I could not wear Falkor for more than 20 minutes at a time. On the plus side, the costume was very easy to move around and not hot at all! For transportation purposes, the head and legs detach from the main body to make it easier to transport. 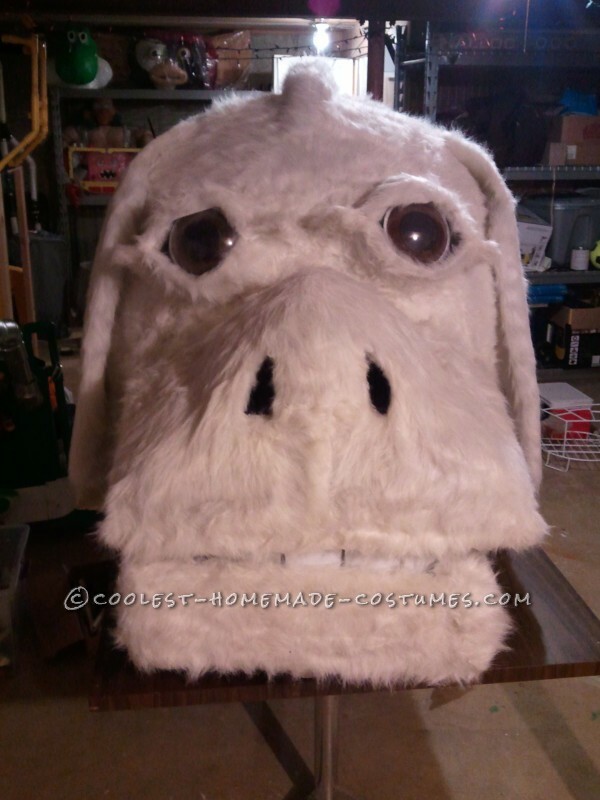 I would say the overall cost to make Falkor was right around $300 and took about 50-75 hours. My next stop is Costume Con in the Spring! 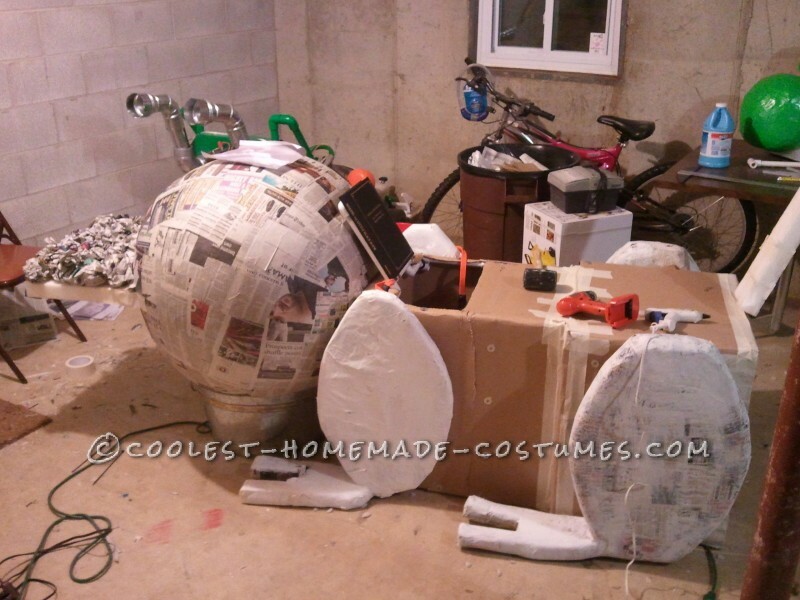 I am excited to debut the costume on the Coolest Homemade Costume website!